We’ve been strawberry picking a lot lately, and my daughter and I have gotten really into making strawberry soup. She adores the flavor and texture and even can make a lot of it with me. We have a great time together in the kitchen. I even put her in charge of picking the mint for the garnish. This soup can be flavored up a ton of fun ways, so encourage your kids to make it with you when they request it over and over for lunch and dinner. It would taste delicious with some basil mixed in, a little chopped cucumber, or even a splash of chive oil if you really feel fancy! 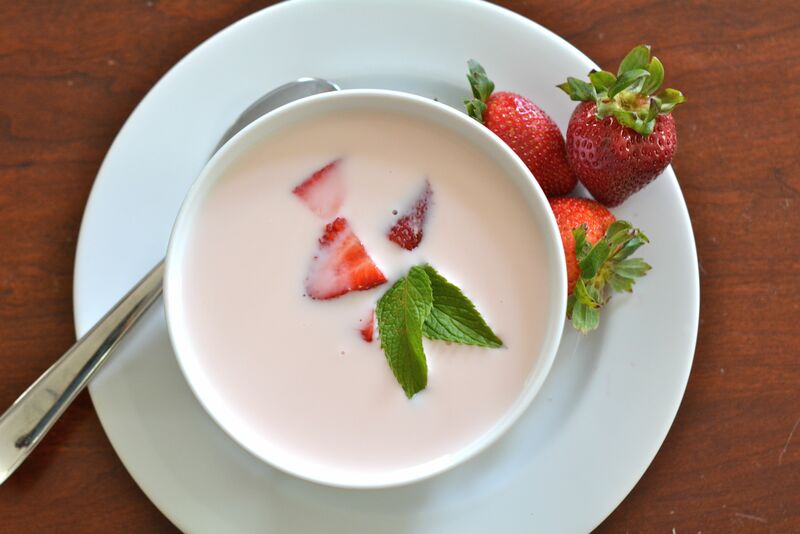 Here is how we make strawberry soup—I hope you enjoy it as much as we do! Step 1: Place all of the strawberries, orange juice, sour cream, and yogurt in a blender and blend until completely smooth. Step 2: Ladle the soup into bowls and serve. Garnish with a tiny dollop of yogurt and a mint spring!